This is a Chinese name; the family name is Goh. 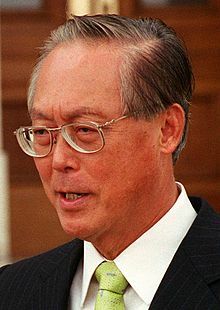 Bole Goh Chok Tong (simplified Chinese: 吴作栋; traditional Chinese: 吳作棟; pinyin: Wú Zuòdòng; Pe̍h-ōe-jī: Gô Chok-tòng; born 20 May 1941) was the second Prime Minister of the Republic of Singapore. A member of the People's Action Party (PAP), he became Prime Minister on 28 November 1990, succeeding Lee Kuan Yew, and served in the role until 12 August 2004, when he stepped down and was succeeded by Lee Hsien Loong. He subsequently served as Singapore's Senior Minister until May 2011, and as the Chairman of the Monetary Authority of Singapore. He continues to serve as a Member of Parliament (MP) representing the Marine Parade Group Representation Constituency and holds the honorary title of "Emeritus Senior Minister". ↑ Asiaweek, Volume 20, Publisher Asiaweek Ltd., 1994, p. 20, ...few non-communist leaders have admitted to not believing in God, though Goh Chok Tong came close. This page was last changed on 23 September 2017, at 04:59.